Modern Fishing NZ topwater article “The Lord of the Kings”..
An emerging top-water kingy fishery in New Zealand’s beautiful North Island saw the Modern Fishing team once again racing across the Tasman to do battle. As New Zealand’s rolling green fields dotted with sheep and craggy mountain peaks came into view after hours of looking down at nothing but water, I shifted in my seat excitedly. Only two weeks earlier, Nick Janzen and I had been travelling around the country’s South Island in search of big brown trout, and as our plane’s wheels kissed the tarmac of Rotorua’s International Airport, I felt like I’d arrived home. For the Aussie angler, there’s no shame in being a bit of a traitor and admitting that Kiwiland is paradise. 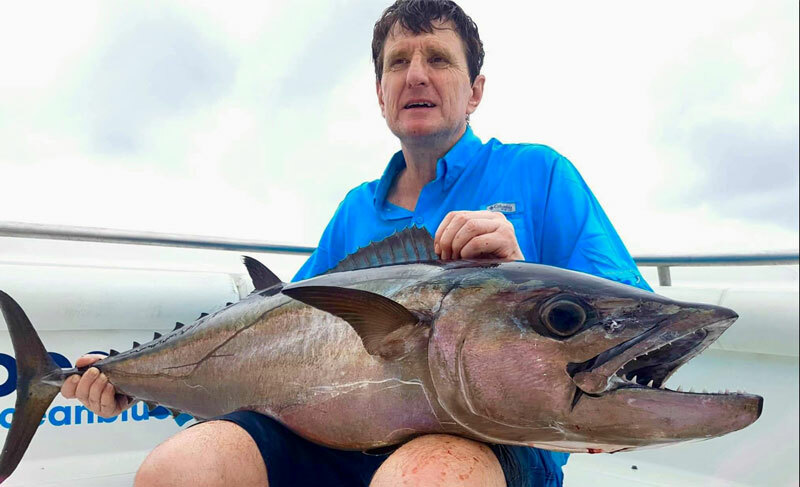 Alongside David Noble of Ocean Blue Fishing Adventures, and a host of Ocean Blue Adventures Club members, I felt a little daunted by the altogether different class of fish we were to be chasing on this latest overseas sojourn. The type of fish that would eat my pb 6lb brown trout for an entrée, were they unlucky enough to share the same saline environment. “Make sure you’re fit and bulked up– you’ll be hauling in 20kg-plus hoodlum kingfish for four straight days!” David’s words from months before echoed in my ears as I sheepishly looked down at my pot belly and nervously squeezed my bicepless arms on the bus from Rotorua to Tauranga. I could hear the broad-shouldered, surface-lure-smashing yellowtail kingfish chuckling mercilessly already. They had been working out. When you’re on a serious fishing trip, abroad or otherwise, accommodation is rarely of great concern. A simple bed on which to rest a tired body at the end of every day is often all that’s required – and sometimes, all that’s provided! It was with relief and some excitementthat the Sebel Trinity Wharf hotel turned out to be one of the more comfortable and convenient I’ve stayed in on a fishing trip. Located right on the harbour with wharf access for pick-up and drop-off each day, and only five minutes from the centre of the vibrant touristy town centre of Tauranga, fishing and frivolity were mere minutes away. The nightlife was a far cry from the sometimes deserted country towns of the South Island we’d travelled through, and some of the younger singleguys on the trip noted that the Bay of Plenty must not only have received its name on account of the hot fishing. The married anglers’ views have been stricken from the record. On the night before we hit the water, our hotel rooms resembled tackle stores. Stocky jigging sticks and powerful, long stickbaiting rods bristled along every wall, and rolls of jigs and piles of surface lures formed small mountains on beds. Spools of heavy leader unfurled in every direction, heavy trebles, singles and split rings rattled in containers like maracas. The excitement in the air was palpable and the anticipation hummed through the room as if being transmitted from an enormous vibrating mobile phone. Before dinner and a couple of local ales were consumed, we were paid a visit by our head skipper and Aussie expat, Mark Armistead. 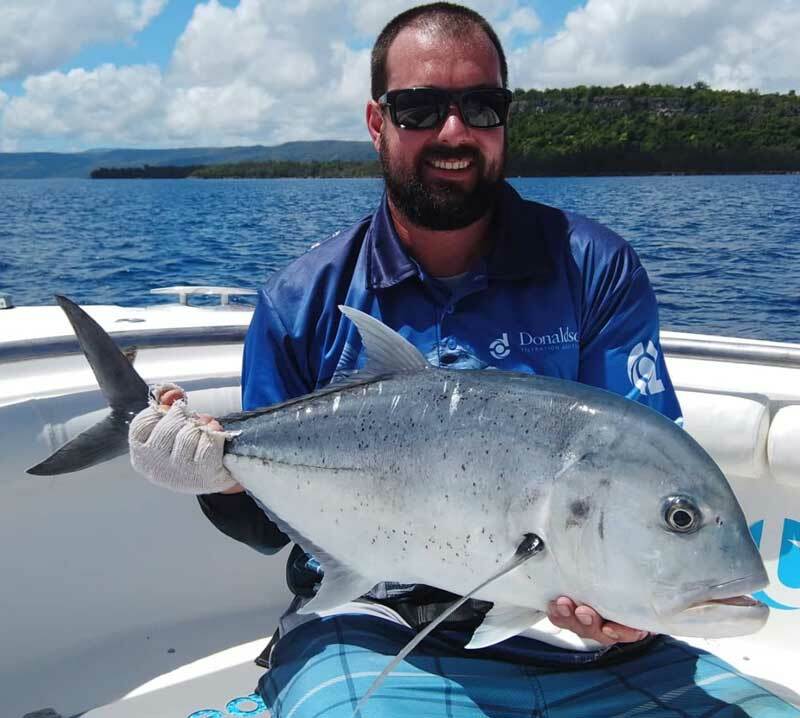 Mark is at the forefront of an emerging fishery in the North Island’s Bay of Plenty, and he and Ocean Blue Adventures are combining to bring Australians across the ditch to get a slice of it. Friendly and enthusiastic, Mark’s the perfect guy to fish alongside, whether you’re a beginner or an expert. Don’t be fooled by his light-hearted cheery personality – this guy’s a machine. The type of freak who can jig in 200m of water all day without raising a sweat. Mark talked us through the days of fishing that were to come. Like excited schoolkids receiving instructions from a teacher before an excursion to Dreamworld, we attentively listened to Mark’s description of the days ahead and what they would entail: huge schools of kingfish launching themselves at poppers and stickbaits before screaming off at warp speed. Locked drags, explosive visual strikes and aching backs and burning biceps. The seven anglers were divided among two boats that offered heaps of room from which to fish – even with all anglers casting heavy stickbaits. Mark was at the helm of one, while the equally skilled, bloody hilarious and born-and-bred kiwi Colin Tecofsky took charge of the other. Colin is an expert soft-plastic fisherman – snapper across the Bay tremble at the sound of his vessel, Legal Action, motoring their way for a drift. He’s a riot, too. He had us doubled over with laughter at his stories and jokes all week. Parental guidance and viewer discretion is advised. Mark is the stickbait master, but both of these guys know what they’re doing in all forms of productive local fishing methods, and are way ahead of most of the local pack in terms of methods and results. In fact, during the four days we fished the fertile kingfish grounds of the Bay of Plenty, we noticed only a handful of boats giving the top-water action a go, while we enjoyed constant success with the surface lures the boys have helped pioneer in the region. I was never in any doubt about the class of kingfish we were to encounter with Mark and Colin at the helm, but what made this trip something special was the sheer number of fish. As we pulled up around wheeling birds and sporadic bust-ups, fellow angler Justin Ayres sent a massive stickbait rocketing skyward from one side of the boat, while Brendan Coote lobbed out another from the other. Being used to fishing for kings in Sydney, I was fully expecting to have to be patient and wait for a hook-up. As I rested, camera in hand, excited screams from both anglers had me running from gunwale to gunwale in a frenzy of clicking shutters. Packs of kingfish rose on both lures as they splash-danced their way back to the boat. The gang of hoodlums on Brendan’s lure narrowly missed the hooks after several enormous surface strikes, while Justin’s reel began howling like Janis Joplin. 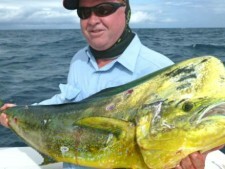 A fat 15kg kingfish came to the boat after a short but brutal fight, and the trend had been set. Brendan cast his stickbait out again, once the high-fives and laddish hooting and hollering subsided, and landed his first king of the trip several minutes later. The trend had been set. What followed throughout the trip has since become a blur. If you asked me to count how many kingfish we landed over the four days, I could only hazard a guess at 300. The number of 20kg-plus fish would surely have been in the dozens. Next time I’ll take a belt to notch as we go, but you get the idea. We divided and conquered throughout the trip, switching boats and skippers each day to ensure we got a flavour of everything both vessels and guides had to offer, as well as allowing us the opportunity to get to know one another better and recycle the same tall fishing yarns and tales of woe and glory many times. I’m not a GT-popping expert. In fact, this type of big-lure-hurling was something pretty new to me. It was interesting to talk to the mix of guys on board about it, however. Being Ocean Blue Adventures Club members, many of the boys had done tropical GT trips to various parts of the world . 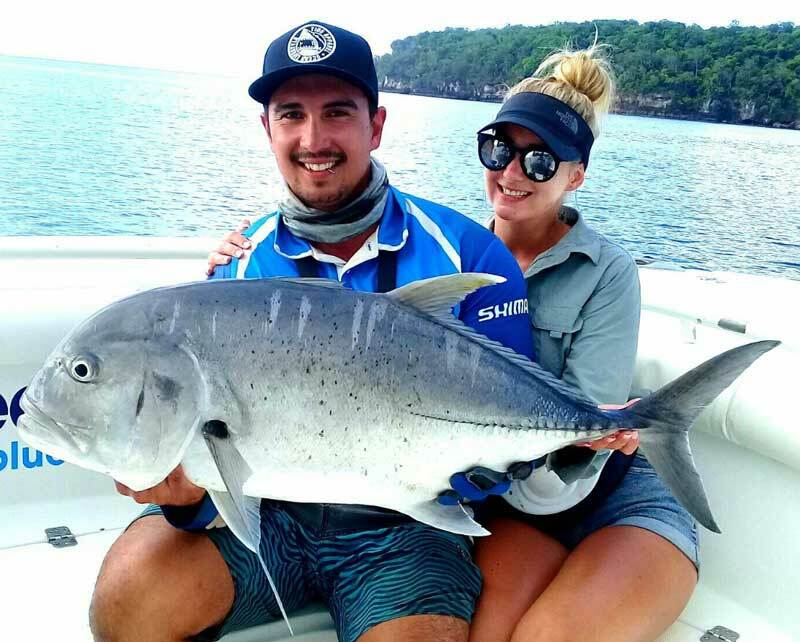 GT-popping is definitely right up there with the most brutal, expensive, painful and exciting fishing on earth, and what confirmed this latest Ocean Blue venture as something special was the affirmation from some of these GT-junkies that this fishing matched and surpassed their favourite source of adrenaline. Another great advantage this fishery when measured against GT stickbaiting is the lack of razor-sharp bommies being cast to. 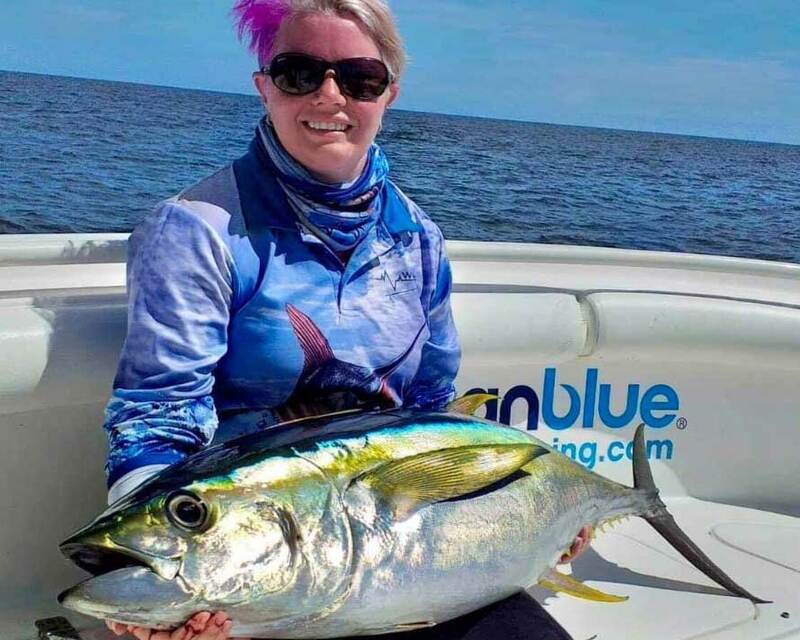 Generally, casting blindly from either side of the boat can raise kingfish, so accuracy is not as important as when aiming at distant structure, and your chances of getting dusted instantly are next to zero. Notably popular stickbaits included those from Angel Tackle, Carpenter and Orion, but these fish weren’t too fussy. 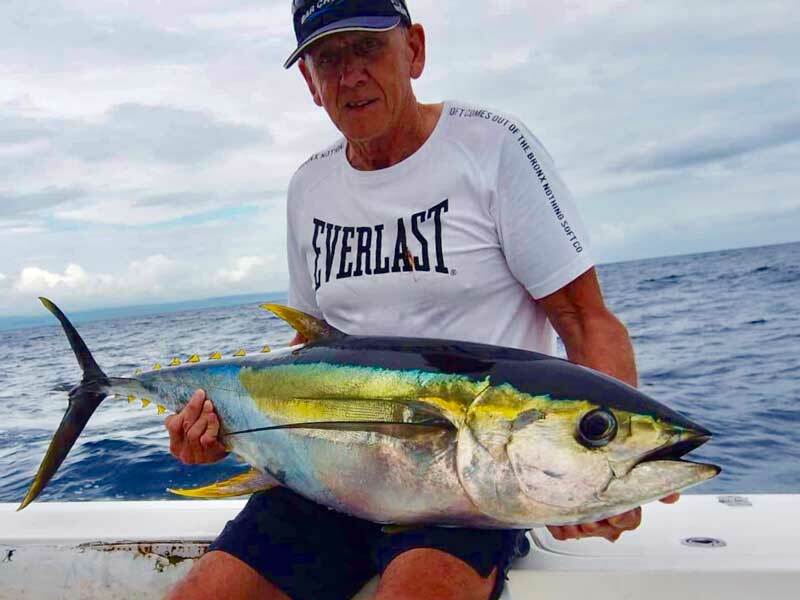 See skipper Mark Armistead’s advice on the previous page for more information on the gear and lures he recommends for this trip. It was interesting to note that Victorian Andrew Pennisi was the only one of us to land a fish on a popper all week – for some reason the kings weren’t going as ballistic for the big bloopers as they were for the swaying stickbaits. Every lure has its day in the Bay of Plenty, however. So many fish, so many great moments and so much pain and excitement can make it difficult to narrow it down to specific tales of shock and awe. Moments that will stick in my mind include watching schools of panic-stricken squid fleeing around the boat while at least 30 enormous big kingfish moved in on them in front of our eyes. The water became black with ink while a triple hook-up added to the pandemonium. You don’t get that kind of amazing visual action when jigging – though we managed plenty of good fish on jigs, too. Forgiving, powerful and short jig sticks gave our quickly deteriorating backs and arms a bit of mercy from the pain inflicted by huge kingfish on 7-8ft casting outfits! It’s easy to get swept away by the heavy-tackle fishing for kings in the Bay of Plenty, but during a four-day trip there’s time for so much more. New Zealand’s famous big snapper proved a little tough to tempt – though we found countless plate-sized fish and a few that easily busted 10 old-fashioned pounds. Schools of suicidal salmon (kahawai) busted up everywhere, and ate some stupidly big lures. We caught one on a 400g jig and another on a huge stickbait – a far cry from the 5-10g metal slices I’m used to having to finesse these tough little nuggets with. 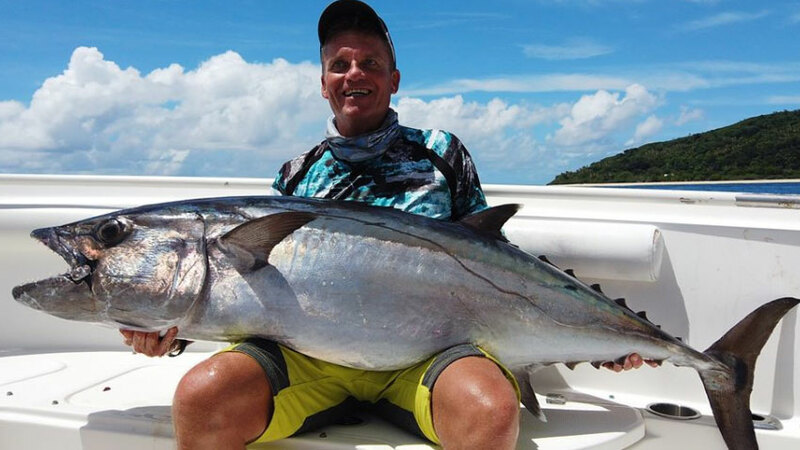 Silver trevally schools also balled-up and provided great sport, going even harder poundforpound than the kahawai. These three species not only allowed us to use lighter line and lures, but gave us some inshore options for when the offshore weather was proving a little stomach-turning. About halfway through the trip, Dave suggested we take up a light- tackle (20lb line or less) challenge, so we began using the outfits with which we’d been fishing for salmon, snapper and trevally, targeted the same massive kingfish we’d previously been arming ourselves with 80lb braid and seriously powerful outfits to land! 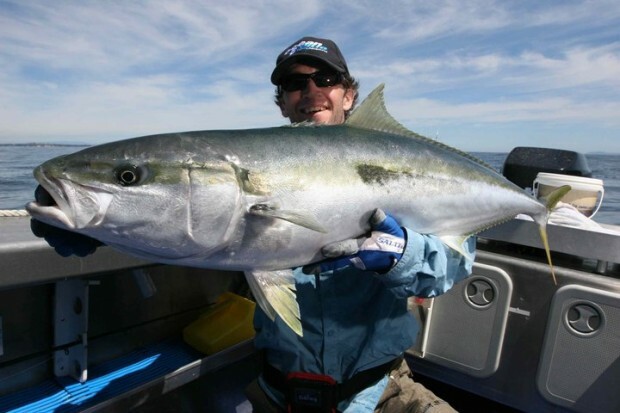 There’s a rumour going around that Kiwi kingfish don’t fight as hard as ours. Let me be the first to quash it. True, we managed some stupid, stupid captures with the light gear – Dave was crowned light-tackle champion with an estimated 18kg fish, while Colin and Newcastle angler Peter Childs both caught fish that would have nudged 15kg on the humble snapper sticks – and while you wouldn’t have a hope in hell with such light gear on our east coast, the answer doesn’t lie in Kiwi kingfish strength. Water depth is key – not only were the majority of our fish hooked very high in the water column on warp-speed-retrieved plastics, they also often had more than 100m of water to swim through before hitting the bottom to complete the famous kingy smoking! Just ask Dave, who fought his 18-kegger for more than an hour on silly string, if it was easy! We also got the saltwater fly rod out and hooked a couple of rats, and at one stage I gave a 2500-size spin reel loaded with 10lb braid a go. Got smoked. 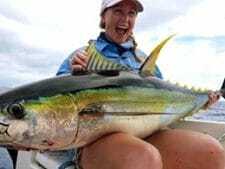 As a Sydney angler, a trip like this carries an inherent problem: I may never be satisfied with the fishing in Sydney again! As good as our kingfishery is, the image of huge schools of 20-30kg fish smashing the surface to froth can’t escape my mind, and that kind of action is simply not on offer here – not regularly, anyway! The species is the same, the proportion and the numbers are completely different. Don’t let that stop you though – not only is New Zealand cheap to fly to, the exchange rate is excellent and the packages Ocean Blue offer to get you over there are surprisingly cheap. In the same time it would take you to drive a few hours up or down the coast to chase big fish, you could have cleared customs and be on the bus from Rotorua Airport to The Sebel, waiting for the boys to pick you up from the jetty and get you into some real kingfish. “Not only is New Zealand cheap to fly to, the exchange rate is excellent and the packages Ocean Blue offer to get you over there are surprisingly cheap” And because nearly all fish are released to fight another day and Mark, Colin and Ocean Blue are pioneering the amazing market for this fishery, you can be assured it’s in safe hands, and will only continue to get better! Mark Armistead get’s his GT passport stamped in New Caledonia!